Kingston Smith has produced its annual survey of UK agencies’ financial performance (including PR agencies), which shows that the industry in the UK grew by 3.5 per cent to reach an income of £1.3bn although operating profits were down a bit. Most of the numbers are from 2012 (reported in full in Campaign here). The survey highlights a few companies as bucking this modest trend, most notably Inferno which is stacking up the profits. Of the big agencies M&C Saatchi and AMV/BBDO did well (they nearly always do). The main reason given for the modest bottom line performance is increasing agency staff numbers, mostly more young, relatively low-paid people. So no change there then. UK adland remains a black hole for anyone between 35 and 50. The pay of the top five execs in the survey is rather more intriguing. 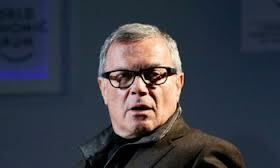 At numero uno we have – surprise, surprise – WPP’s Martin Sorrell (left) with £17.6m. But, then, you do. If Martin were made redundant the total profits of UK-based agencies would probably go through the roof. In second place is another international wheeler dealer, Jerry Buhlmann of Aegis, on just over £2m. Which reflects the view of his former shareholders, probably, who cashed in mightily when he flogged Aegis to Dentsu. Then it’s Lord Chadlington (Peter Gummer as was) of PR group Huntsworth on just over £1m (up from £677,000 – which shows that even industry veterans can earn pay rises) followed by Chime CEO Chris Satterthwaite (Chime now owns VCCP and a gaggle of sports marketing businesses) on £823,000, down from £899,000. Most interesting, perhapsm is Tim Dyson of PR-based comms group Next Fifteen, who earned £479,000. Next Fifteen (chaired by Richard Eyre) has kind of snuck up as a global company with 48 offices in 18 countries. Its brands include tech PR company Text100 and Lexis PR. No doubt there are other people earning as much or more than this through dividends and the like. So it’s an industry with a decent amount of cash washing around, recession notwithstanding. Now you know why the Poisoned Dwarf is a “Math Man,” rather than a pathetic “Mad Man.” As my old Dad used to say… It’s the rich wot gets the gravy, it’s the poor wot get’s the blame. Time to go… “Black Friday” hasn’t finished yet… More shopping to do!